The Coachella Valley from the heights of the San Bernardino National Forest over to the snow capped northern side of the San Bernardino Mts. I fully realized, while surrounded by cooler air and wildflowers in the San Bernardino Mountains, that Palm Springs is a lot more than Bentley motor cars. Within an hour’s drive are destinations favored by people for hundreds of years. White settlers built towns at these locations in the late 19th Century. Fashionable Lake Arrowhead and diverse Big Bear Lake in the northern mountains, family camping/cabin oriented Idyllwild on the southern side of the valley and the vast desert spectacle of Joshua Tree National Park are all easy, or leisurely, day trips. It was 105 (F)/37(c) on a June day as I drove up dramatic Route 74 between the Santa Rosa and San Jacinto Mountains. 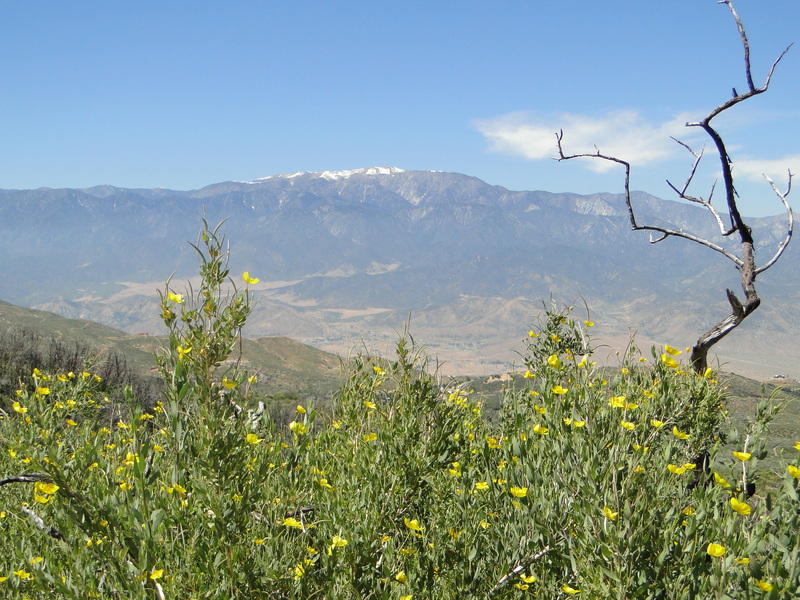 The harsh, barren desert on this leeward side of the mountains slowly gave way to lush vegetation within the San Bernardino National Forest. So did the temperature. By the time I reached Idyllwild at over 5,000 feet elevation it was 80(F)/35 (C). I could make a play on the town’s name: In Idyllwild you idle away your time. It’s a charming, log cabin town within tranquility and beauty. Restaurant Gastronome (54381 Ridgeway Drive) was a decent choice for lunch. Wood frame, stone fireplace, beam ceilings, stained glass bar and a pleasant tree-shaded terrace to dine outside. Nothing special except the atmosphere and the moderate prices for lunch. 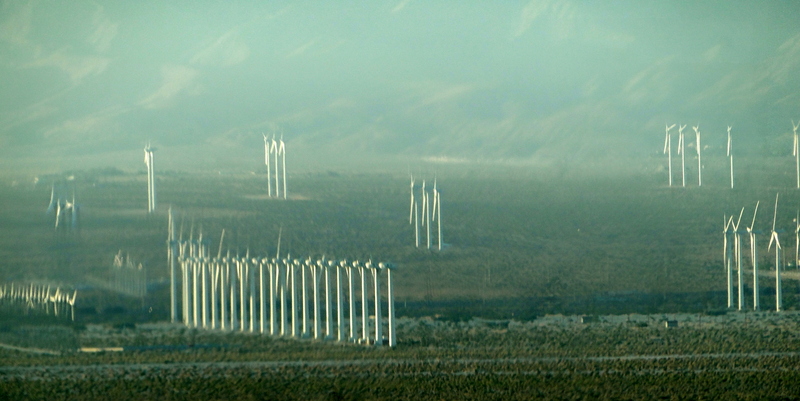 Driving north out of the valley towards Joshua Tree National Park, I passed the town of Desert Hot Springs, although the name should be “Desert Hot Winds.” With constant winds in excess of 40 miles per hour, the mountain sides are covered with thousands of wind turbines providing over 20% of the Coachella Valley’s energy needs. Joshua Tree National Park is vast. At 4,000 feet elevation it’s not as hot as the valley and at night it usually is cold. The park preserves the Joshua tree, a unique palm that is indigenous only to this specific region of the southwest. Besides, the landscape is stunning and the rock formations spectacular. At one lookout the San Andres Fault is clearly visible. 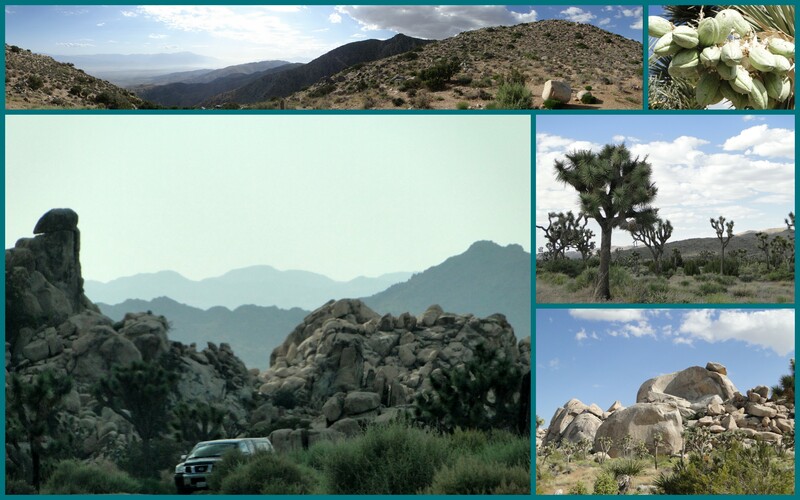 Fifty miles north of Palm Springs, the park is an easy day trip. Fortunately I was not driving the car as we climbed the San Bernardino Mountains along the eastern flank on our way to Big Bear and Lake Arrowhead. If I had been driving, the car would have sailed off the road because I could not stop turning my head to look at one beautiful scene after another. From the scrub desert, the 7,000 foot ascent transforms into lush forests and narrow valleys filled with clouds. The lake region is popular all year round with skiing in the winter. Big Bear Lake stretches for miles with a succession of communities both gated and so laid back it looks like the 1960’s. 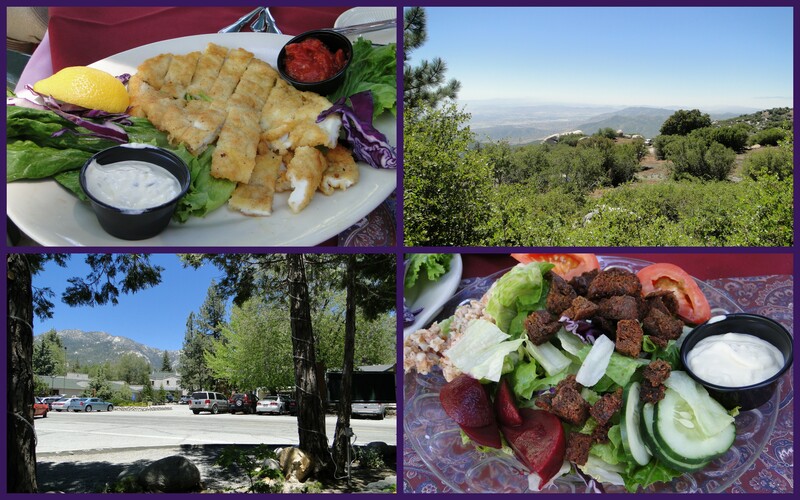 Lake Arrowhead is tony with a designer town, shops and restaurants to match. 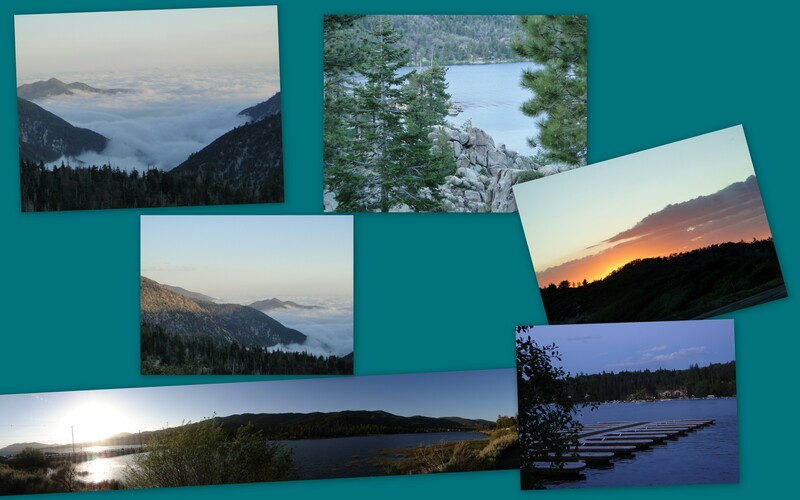 Once more, the landscape is stunning and in summer, the temperature at Lake Arrowhead in the evening was 65 (F)/17 (C). I took a day trip, but the drive to Lake Arrowhead from Palm Springs via I-10 west and San Bernardino takes less than an hour. The Palm Springs Museum of Art is a gem. I don’t know why I was surprised by the exceptional quality of its collection considering the wealth in the Coachella Valley. 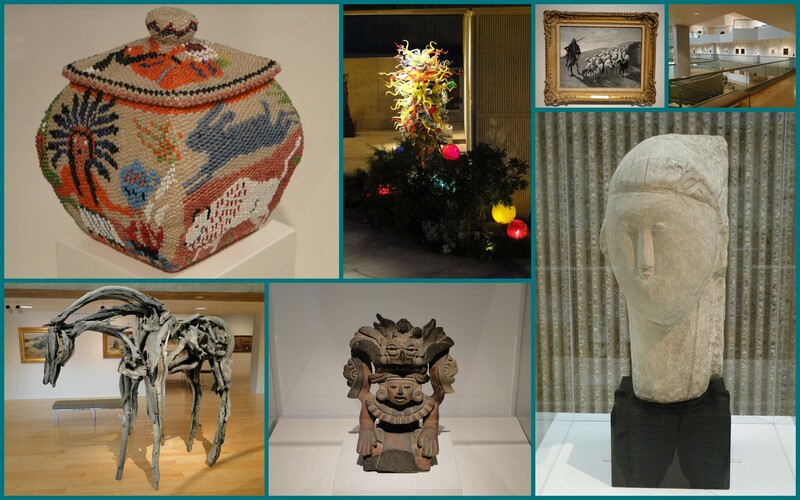 Ranging from mesoamerican art, classic 19th century American west paintings, southwest native crafts to modern sculpture in bronze that mimics dessert drift wood, the museum is a calm, enriching atmosphere. 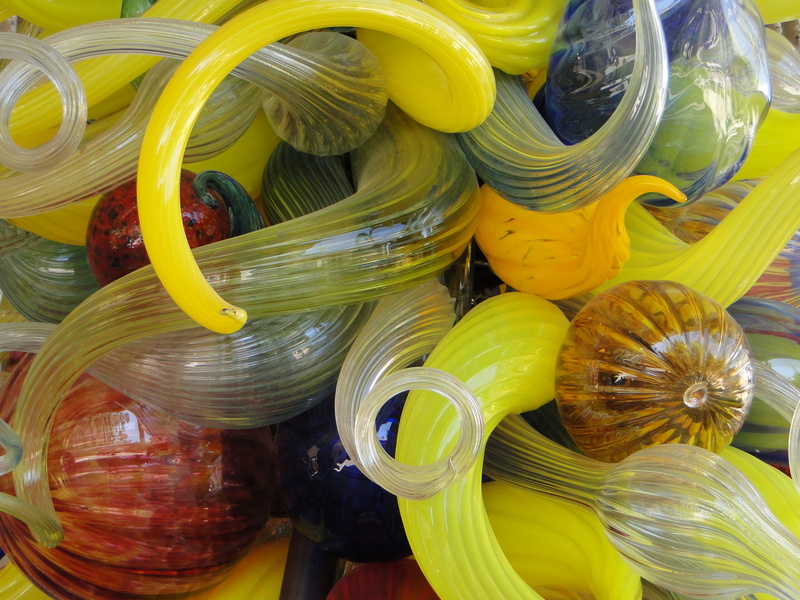 The lower level sunken outdoor sculpture garden is a delight with pools, fountains, glass and bronze art works. The temperature in the garden is a good 10 to 15 (F) cooler! 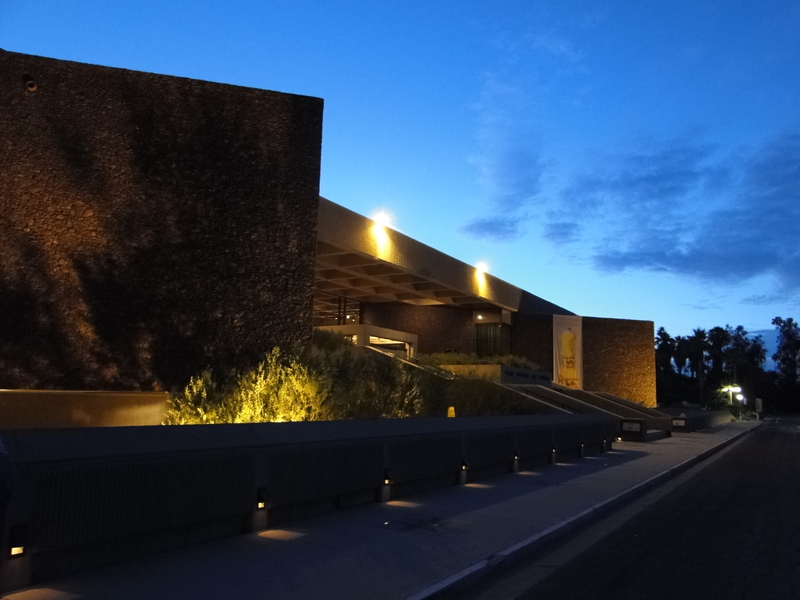 At night you can walk outside the building and look over the wall at the illuminated sculptures garden. Palm Springs and the surrounding area has no shortage of hotels from budget to ultra-lux. The historic district of mid-century modern homes has the oldest (1920’s) and finest small inns in the city. Many of them are in the $100 – $200/double range in off-season, and some even in-season (November – March) and blend so well into the residential community as to go unnoticed as hotels. Best of all, they are within easy walking distance (2 or 3 blocks) of Palm Canyon Drive and the heart of Palm Springs. The Old Ranch Inn is a suburb 8-room hotel with its casita rooms surrounding the inviting swimming pool with a beautiful view of the mountains. An original late 19th century ranch, the owners first built casitas and a pool in the 1920’s for Hollywood visitors. By the time its current owners purchased the property ten years ago, time and neglect had taken its course. Ed and Larry painstakingly restored and upgraded the inn into well decorated large suites with kitchenettes, private baths, private patio retreats and a few fireplaces. The atmosphere is that of a weekend house party since the pool is the afternoon and early evening gathering spot. Conversation flows freely and new friends are made. A hotel can chart its success by the number of repeat quests, and when more than one room is occupied by repeat guests from Europe, I’d say the Old Ranch Inn is secure. The Palm Springs dining scene is eclectic but heavy on grilled meats, southwest and Mexican food. There are many decent restaurants, but only one outstanding establishment, Copley’s on Palm Canyon ( 621 North Palm Canyon Drive). It’s setting itself is historic, the restored 1930’s adobe-style home of Cary Grant. The huge interior courtyard garden provides excellent outdoor seating for pleasant evenings. The interior space has been opened up, decorated with warm colors and western art. 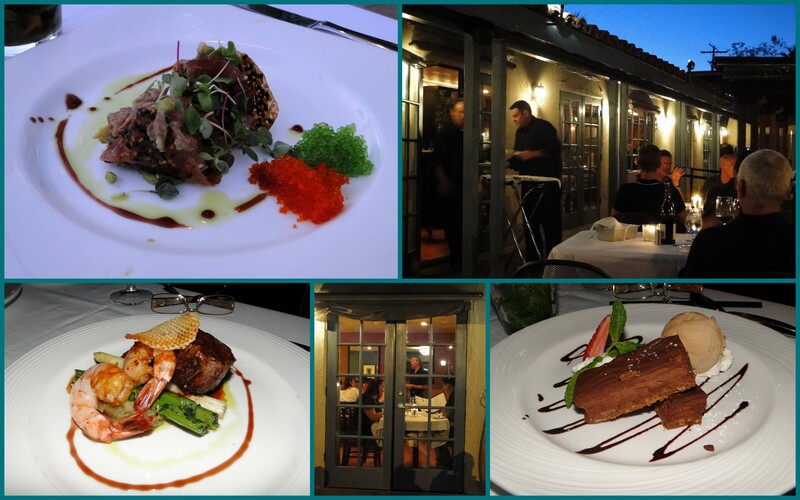 The cuisine is excellent: mini-sushi tacos with red & green roe, butter-tender filet with spicy grilled shrimp, generous Neiman Ranch pork chop, rich chocolate pate with homemade mocha ice cream and lavender pound cake with homemade basil ice cream. Arrive before sunset and watch as the desert’s dusky sunlight plays with the mountains and the blue/black night emerges punctuated by candle light. Palm Springs can be magical.